This issue featuring another look at my favorite book in the series, The House On The Cliff, a look at The Secret Of Wildcat Swamp, new collectible discoveries, letters, the Mike Humbert Department and more! Missing since the case of the Disappearing Floor, the body of Mr. Tanwick was discovered in a vacant lot behind Bayport Police Department Headquarters by Frank and Joe Hardy and an unidentified female companion, thus putting an end an exhaustive 62 year manhunt. Questioned at the scene, Detective Oscar Smuff of the Bayport PD stated "Yep, it's him all right unless, of course, it isn't." "We would have found him eventually anyway," Patrolman Con Riley noted "even without those pesky kids. It's pretty hot and once the wind shifted toward the station house, we'd have caught a whiff of him." "We suspect foul play," stated Chief Ezra Collig "since no wallet or watch was found at the scene." "I'm glad this case is finally over." Frank Hardy remarked "Not finding Tanwick was the only black mark on our career as teenage crime fighters for over 60 years." "I'd like to go see Iola now" commented Joe Hardy "but I don't know if I'm the Casefile Joe or the other one. It's all very confusing." "That Tanwick fellow certainly has a lot of gall! My nephews traveled around the world and into outerspace looking for him and now he turns up dead!" raved Gertrude Hardy, noted paranoid, old maid and aunt of Frank and Joe, as she was being led away to the Bayport Home For The Incurably Annoying. "Of all the nerve! Some people have no consideration. In my day, we'd have had him horsewhipped! Here my nephews spend 60 years trying to return his wallet to him and now this is the thanks they get. I told them they should have just kept the damn wallet in the first place but no, they thought they knew better. Those young whippersnappers could learn a thing or two from their old aunt but do they listen? No! Serves 'em right anyway, the brats! If only their mother wasn't such a spineless jellyfish, maybe those kids would have more respect for women. Why their father is never around, I'll never know. Always gallavanting off to solve crimes all over the place. Better he should stay home but will he listen? No! They're all against me anyway." The Bayport Times is proud to bring you this exclusive artist's rendering of the dramatic moment of discovery! A July 29 article in the NY Times by David Kirkpatrick (carried by the wire services to other papers around the country) stated that while Simon & Schuster has plans to overhaul the series, they don't plan to end it. Editor Anne Greenberg stated "We are always evaluating how to keep the series fresh and relevant." It's too early to know what changes may be coming, she said, but ending the series "has never come up." In major league baseball, the sure kiss of death for any manager is when the owner or general manager tells the press that they have no plans to replace him. 99 times out of 100, the manager is gone within a week! Let's hope the same won't apply to our heroes. From the collection of Tony Carpentieri. Note: Photos have edited for use here. It was with great excitement that I started to read The House on the Cliff. It had been about 10 years since I read the first 89 books (original text only) in the series. During the interim, the only solo Hardy's I have read were: Screeching Owl, Secret Tunnel, Haunted Fort, Flickering Torch, and Spiral Bridge. These are among my favorites. But this time I opted for the revised edition of House on the Cliff. It was after all, this version that I originally read, circa 1964. I decided to read the original text book immediately after the revised and compare the two. Nothing in depth here. Not a scholarly thesis. Simply my impressions of the two books and a few observations I found pertinent (to me at least). I'll start with the 1959 edition of The House on the Cliff. The very first thing that grabbed me about this book was the PC cover art. It shows Frank, Joe, and Tony Prito in the Napoli on Barmet Bay. They are near the base of the cliffs that form the outer boundary of that body of water. The Pollitt place or the House on the Cliff is visible atop the cliff while a row boat (probably with a smuggler in it), is escaping scrutiny by making its' way through the rock strewn waters at the cliff's case. I don't know if Rudi Nappi is responsible for the interior art only or the great cover as well. The proper mood is created before a page is even read! I further note that Harriet S. Adams is credited with re-writing this version, based on the 1927 original by McFarlane. One curious thing I noticed as the story begins with Fenton Hardy filling in Frank and Joe with info on his latest case, is that no mention of their last (only one) case as I thought was usually the case. Now I know the Hardy Boys series did not go into a book by book review of previous cases or stories, as is the case with Tom Swift Sr., Bomba the Jungle Boy, and The Rover Boys, but usually their last book is mentioned. In this case, that would be The Tower Treasure, and it is not. However, the Tower Mansion is mentioned in passing (the boys and their chums were in fact passing it, on The Shore Road), on page 66. Biff Hooper and Chet Morton join the boys on motorcycles as they journey via The Shore Road to the cliffs at the edge of Barmet Bay. Their goal, to be on the lookout for pharmaceutical smugglers operating in the Bayport area. I note that The Shore Road is actually described as "the shore road", as if it had no name but only a description. I assume this changes by the time of The Shore Road Mystery. The boys set up their telescope at the edge of the cliff near the Pollitt house, which has been deserted for years. Or has it? Talk about luck, the Hardy's spot a suspicious meeting on the bay between a large cruiser type boat and a much smaller one. Before they can really comment on this they are interrupted by an almost inhuman shriek of pain, emanating from the Pollitt place! A search turns up nothing but their motorcycles are tampered with and their tool kits stolen. Must be message of some sort! By this time I've realized a few things about the Hardy Boys books. It would appear that "fellows" has replaced "chums" for the brother's friends. Even in 1959, "fellows" is used? Perhaps, I was only 5 and don't remember. Joe always asks Frank, one year his senior, what to do next. This happens two or three times in this book. Come on Joe, get out of your big brother's shadow! Chief Collig of Bayport is no longer a buffoon (page 61). I wonder (how? why? when?) that transformation took place! Iola Morton (page 50) is no longer pleasantly plump (the way I thought Joe liked his girls). At least Callie Shaw is still vivacious and Frank's favorite at Bayport High. Fenton Hardy goes missing again (page 53) and it is up to the Hardy's to find him, thereby solving the case. I enjoy this type of mystery, because if the bad guys are so good (or ruthless), that they can imprison Fenton Hardy, legendary private detective, then they ar foes worthy of Frank and Joe's utmost sleuthing abilities! Oh, and Chet is the most superstitious and cowardly of all the Hardy friends. His voice is always quavering but the stout lad does come through when the chips are down. Frank, Joe, Biff, and Chet witness a grenade attack during a race for freedom by a mystery man on Barmet Bay. After saving his life they bring him to farmhouse of the Kane's to fully recuperate. It is thought the smugglers responsible for this attempted murder. The boys go home for dinner but want to skip some of it so they can question the victim of the grenade attack. When Mr. and Mrs. Hardy demur they are forced to wait. Had Fenton Hardy not caved in to his wife's demands (page 36), his sons would have been at the Kane farmhouse in time to prevent the gang's kidnaping of the man earlier attacked (page 44) and the trussing up of the Kane's themselves! Way to go Mrs. Hardy, feel bad? We don't know because that subject never comes up. I guess the Hardy Boys aren't into "I told you so" attitudes. They call her "Mother" (page 36), while Fenton is "Dad". After releasing the Kane's, the Hardy's promise to keep them informed of further developments in the pursuit of the smugglers ( page 49). They never did. I was amused when Mrs. Kane felt compelled to add that Henry (her husband), put up an awful good fight but was heavily outnumbered (page 48). Would it be so wrong to be over powered by a younger and stronger opponent? Seems so. I guess "Felix" was a more common name that it is now, back in 1959. Both Pollitt and his nephew Snattman (said to lead the bad guys in this book), are named "Felix". As it turns out, the nephew is leading the ruthless gang of pharmaceutical smugglers from a secret hideout in the very mass of the cliff. A secret stairway between the Pollitt place and the pond at the base of the cliffs complete the hideaway. And what exactly is lemon soda (page 92)? Is it like Squirt or Fresca? In chapter we meet Tony Proto and his boat the Napoli. So when does the Sleuth come into the series? The Hardy's are joined on the Napoli by Phil Cohen and Jerry Gilroy (pages 67 and 155). The last two fellows are sort of "fringe" buddies. They don't always appear as Chet does. Biff and Tony are pretty common, but not in all books. Some final notes: the term "the house on the cliff" was utilized 7 times (pages 11, 51, 79, 89, 102, 11, and 164). I found it charming that the Hardy's two story garage at their home in Bayport, had once been a barn (page 34). It's good to know that Bayport had a not to distant rural past. Chet hasn't taken up any hobbies yet and the interior illustrations were not badly done. In particular, the one on page 76. Each character is accurately portrayed and as for Pretzel Pete (opposite title page), all I can see is "a rousing cheer" for that worthy informant. Overall I think that despite the revisions, The House on the Cliff retains the essential essence of The Hardy Boys. I would definitely include this in my top ten Hardy Boys list. I give it an A! Next I will discuss the original text version and make observations on the similarities and difference of the two. Naturally the first thing that struck me was the illustration on the dust jacket. I don't believe it actually depicts an actual scene from the book, but it certainly does capture the flavor of the story. It shows the Hardy's and Tony Prito (in the 'Napoli") gazing up at the Polluca place (the house on the cliff), emerging from what appears to be a cave, somewhat across Barment Bay. The actual channel that is in the story is at the base of the cliff the boys are gazing at. No matter, the colors are vibrant and the effect somber. Perfect for this book! I am supremely lucky to have two illustrations opposite the title page. The one that actually came with this edition (lists to Yellow Feather, so 1953 I guess), is drawn by A.O. Scott. The loose accompanying drawing is by W.S. Rogers. Both portray the same scene, the discovery of the stairway in the cavern under the cliff. Rogers' picture identifies the scene as appearing on page 143. Both are are well done and are an interesting look into the particular era in which they were drawn. There were no further interior illustrations, as there were in the revised edition. The story opens differently than the 1959 book did. Here the Hardy's discover the mystery while on a motorcycle jaunt down the shore road (still not capitalized). Chet owns a motorcycle while Biff and Jerry round out the group. It is interesting to note that Jerry Gilroy is described as a newcomer to Bayport (page 3). In the revised book, Fenton Hardy brings his sons into the case. The name of the house on the cliff is changed from the Pollitt house to the Polluca place. However, the previous owner's name is Felix in both (and both were murdered). The previous case solved by The Hardy Boys (The Tower Treasure ) is discussed on page 82 (unlike the revised) and referred to twice more (pages 87 & 211). I like that type of continuity. The next case ("Old Mill"), likewise, is spoken of near the end. This gives fans of that era an idea of what is to come. Nice touch ! Iola Morton is plump (Joe likes a little meat on his girls), while Callie Shaw is a pretty as ever (page 74). There is no Pretzel Pete, which surprised me, as this book was about 30 pages longer than the latter one. The term "the house on the cliff" is used 11 times (pages 58, 76, 87, 89, 108, 124, 132, 181, 208, 209 and 211), as opposed to 7 in the revised. I believe that a slim clue as to the location of Bayport is given on page 56. It is on the Atlantic, south of New England. I know that still leaves from New Jersey down to possibly Maryland (because I don't believe it to project a southern flavor and New York's sea coast is negligable). Still, this comment precludes Connecticut and the other coastlines in the northeast. The villain is changed from Felix Snattman to Ganny Snackley. Both were nephews of the original owner. I think only Snackley actually murdered his uncle. Both are known to Fenton as smugglers though Ganny trafficked in dope as opposed tp pharmaceuticals. I guess there's not much difference after all. Bill Kane, the farmer, again puts up a good fight but is overpowered by the gang. This time it is he himself who trumpets his prowess and bravery, not his wife (page 68). The surname remains Kane from while the wife's name is given as Mabel. I believe they were simply The Kanes in the updated book. It is Bill Kane who first mentions the smugglers operating on Barment Bay, not Fenton (page 48). Again, the Hardy's promise to fill the Kanes in with news on the smugglers as it developes and vice versa. Still doesn't happen (page 69). The injured man rescued by Frank and Joe turns out to be a disenchanted member of the gang, not a federal agent (page 208). The alias is almost the same, Bill Jones becomes just Jones. The accomplice on the ship on Barment Bay changes from Ali Sing to Li Chan, both inscruitable orientals. An interesting statement is made on page 171 by Snackley that Li Chang would enjoy having three white men in his power. Reminds me of Bomba the Jungle Boy. I found it funny that Joe whines to Frank, "but we don't want to go to China !" when they found out their proposed fate (page 173). Please bear in mind that I sort of went about this review in reverse. I should have read the original text version first, then compared the revised edition with it. However, as I had already begun the updated book first, I've had to do this backwards. I hope I don't sound confusing at times. Another character that changes is Bayport Police Chief Collig. He is now a fat pompous fool and his aide-de-camp (Detective Oscar Smuff), is not much better (pages 108 & 109). By 1959 Collig had been transferred into a shrewd and competent police chief. The villains are swarthy, unkempt, of villainess countenance, have thin cruel lips, or have yellow teeth. How is a criminal to escape detection? An interesting tidbit on Tony Prito and his father is that they both hail from Napoli, Italy. Hence the name of their boat (pages 117 & 212). Perry Robinson (of Tower Treasure fame), joins the other chums at various times of the mystery solving. I don't think he appears in too many further adventures. The truck driver who sees Fenton on the shore road, shortly before his capture, is Sam Bates (page 84). They have the same name in both books but the original is a simpleton. It almost seems as if all truck drivers were stereotyped thusly. The reader is made to believe that Joe and Frank are made of sterner stuff than their friends. They bolt from the Polucca place when a half wit member of Snackley's gang. But the Hardy's hold their ground (page 11)! Even Frank finally breaks when the roof starts caving in (page 18) and shouts "Run for your lives! " A curious decision occurs on page 31 when Frank and Joe elect to stay with their friends, instead of going back to investigate the house on the hill. They felt obligated to finish the day with the people they started it with. Then they break up almost immediately afterwards (page 31). Jerry Gilroy was something of a disappointment when he refused to return to the Polucca place for further sleuthing (page 92). This was because of his fear of the supernatural. A portent of a future title is when the cove that serves as the smuggler's access to the cave is referred to as the "hidden harbor" (pages 113 & 114). I think Fenton Hardy's idea of honor is quaint but idiotic. He was asked to sign Snackley's paper with a pledge to not pursue or issue information on the gang, in exchange for his life (page 160). Snackley evidently really expected the detective to honor that agreement and apparently, rightfully so. Your word to a criminal, under duress, carries NO weight. Good grief Fenton! The final battle at the Polucca place, in the stairway and cavern was much better in the original story. More action and it lasted longer (chapters 23 & 24). I was pleased to see that the Hardy's still have the barn in their backyard, even though it had been converted into a gymnasium, where Frank and Joe would congregate with their chums (page 207). The book ends with The Hardy Boys splitting the award money with their father and throwing a shindig! But no Aunt Gertrude? I gave the revised House on the Cliff an A and do the same with the original. They were both superb books! This review is based on the original version published in 1952 but it should be noted that the plot of the revision closely follows that of the original. It is at times difficult to compare the very early volumes with the latter volumes but I regard this story as one of the best overall in the canon. The opening two chapters might be regarded as a bit weak compared to other volumes in the set, since a mystery is dumped into the brothers laps when Cap Bailey pays them a visit at their home. After laying down a framework for the mystery before them, the brothers hope to gain some information by going to the local prison to see some unsavory men who are mixed up in the affair. We are introduced to three memorable criminals: Willie The Penman, Jessie Turk and Gerald Flint. Willie and Flint are already on the loose, Turk is in jail but stages a prison break by the end of chapter 1. The next several chapters are very eventful. The brothers make their way out of Bayport, heading west with the criminals hard on their heels. By Chapter 5, the brothers and Cap Bailey are in Wildcat Swamp, on horseback camping in the desert and the woods near and in the swamp. Immediately they are attacked by "an enormous wildcat", letting the reader know that the beasts are forever lurking through the swamp. Strangely though, no more appear throughout the remainder of the book. From this point onward the book is suspenseful, well written and adventurous with a fairly good mystery that is not solved by dumb luck. The trio spend the next few chapters dodging perils in the swamp while digging for fossils, which is the underlying plot throughout the book. By chapter 9 they are approached by Snake, Snide and Willie, who identify themselves as Forest Rangers and order them out of the swamp in a memorable scene. Later that night the boys eavesdrop on the Rangers in conversation, only to be shot at. The trio stand their ground and refuse to leave the swamp. These middle chapters are fascinating and one experiences that wish fulfillment that the Hardy Boys series is famous for, as we can envision ourselves camping by fire in just such a swamp. While further digging for fossils in the swamp, round about chapter 10, Frank finds a sign ending in "ERS", which fits a sign found in earlier chapters that read "Here lie the Bodies of Twenty Wildcat" Deducing that it was wildcatters, not wildcats, that were buried there suddenly leads to the speculation that oil lies on the property. This detective work blends in beautifully with the title of the book. The Boys visit Mrs. Sanders, the owner of the property, to alert her of their findings then return to their camp. Chet arrives quite unexpectedly and he remains with Cap at the camp while Frank and Joe are away alerting Sanders. Here the book takes its greatest turn as the Rangers, in yet another memorable and suspenseful scene right out of a movie, overwhelm Cap and Chet in a cave and tie them up until they are rescued at the end of the book. Frank and Joe are ambushed on route to Sanders property, but escape a couple chapters later. This book is like something out of 1881 rather than 1952. They hop a freight train, only to have it wrecked and roll off the tracks, hijacked by the Flint's gang. They eavesdrop on a campfire of thieves and eventually learn enough to put away the gang. All that remains is to capture them, which is done over the remaining chapters. This book contains non-stop action and appeals to one's sense of adventure. It is similar to The Twisted Claw, in that it belongs to another era. Often underrated, Wildcat Swamp should be regarded as one of the best books of the series, certainly among the volumes from The Mark on The Door onward. I'm going to take this opportunity to denounce the author of the July 29 NY Times Hardy Boys article, David Kirkpatrick, as a craven, ungrateful scoundrel. Over the course of several e-mails, I provided him with detailed information about the series and collectibles but, when the article finally reached print, the dastardly villian didn't give me any credit, not even a mention! After the article was printed, the lily-livered wretch wouldn't even return my e-mails despite the fact he had pumped me dry for information. Perhaps his coward's heart couldn't bear to face someone he screwed so royally! Furthermore, despite being given the correct information, he made several factual errors in the article, not to mention some very shaky suppositions. Finally, the overall tone of the article was very negative and, at times, downright insulting. Let's hope that Mr. Kirkpatrick finds himself in a dank cave somewhere without Frank and Joe to help him! Basically, what I am interested in is your perspective, as apparently the country's foremost expert on the Hardy Boys, on the question of how the depiction of the Hardy Boys has changed over time. If you ever read the newer editions, how do they differ from the originals? And the sanitized originals? What do you think of the current incarnation of the Hardy brothers? 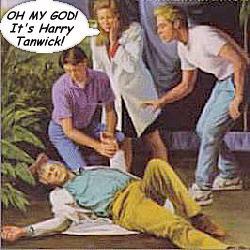 Do you have any thoughts on what has kept people reading the Hardy Boys (unlike so many other serials)?" Alternatively, do you have any ideas about how the market for the original hardy boys books or other memorabilia has fared over time? The Hardy Boys series can be divided into several different "eras". For the first twenty years or so, with a few notable exceptions from 1938-42, the books were written by one author, Leslie McFarlane. McFarlane is universally acknowledged as the best "Franklin W. Dixon". In these stories, Frank & Joe were depicted as more-or-less normal teenagers (without the normal teenage randiness of course) who attended high school and hung around with the same "gang". These early stories portrayed the difficulties they had coordinating their crime solving with their responsibilities at home and at school. The crimes generally took place in or around the boy's hometown of Bayport and usually involved theft or smuggling with an occasional counterfeiter or missing person tossed in. After that, several different writers, most notably Jim Lawrence and Stratemeyer Syndicate partner, Andrew Svenson, wrote the bulk of the remainder stories in the original canon (the first 58 volumes + the 38 revisions) with varying degrees of success. In the 50's, the Boys traveled around the country solving crimes that, quite frankly, were starting to get either repetitious or absurd. By the mid-60's, the series reached it's nadir in the so-called "travelogue" era with the Boys now involved in completely unrealistic stories involving breaking up international espionage rings and traveling all over the world solving crime. The Nancy Drew series also fell victim to this phenomena at this time. A few of the stories are absolutely inane and most of the rest are mediocre with a couple of exceptions. Even the best of these later stories can't hold a candle to first 10 original volumes. In the meantime, the Syndicate was busy "revising" the first 38 titles. These revisions ranged from a mild editing to a complete rewrite. Stereotypical depictions of minorities and other ethnic groups were eliminated for the most part. The leisurely evocative prose that has made the originals so wildly popular was replaced by frenzied action, often times for no apparent purpose. As I stated on my web site, I consider this to have been an act of literary vandalism. Fathers, fondly remembering their experiences with the Hardys as boys, were tricked into buying the books - duped by titles that now contained completely different - and inferior - stories. Grosset & Dunlap lost the rights to publish any new stories to Simon & Schuster in 1979. After existing manuscripts were used up, the stories became even shorter. The plots became even more ludicrous until in 1985, the Hardy Boys were on the space shuttle! At this point the series underwent a hiatus of more than a year until 1987, when the Hardy Boys came roaring back not only in a continuation of the Digests but in a brand new series of more mature stories, the Casefiles. The Casefiles (127 volumes, 1987-1998) launched the Boys into the middle of international espionage and terrorism. The series started off by having Joe's longtime girlfriend, Iola Morton, being blown to bits by a terrorist bomb. From then on it was the Boys traveling around USA and the world solving crimes, often in connection with a US intelligence agency. Although the idea of having teenagers battling international terrorism does seem far-fetched, the stories are generally well written and exciting. It was during this period that there were two Hardy "worlds", the Casefiles, in which Iola was dead and the Digests, in which she wasn't. In 1992, the Hardys joined up with Stratemeyer Syndicate staple, Tom Swift, in the 2 volume Ultra Thriller series. The series was geared more toward the sci-fi Swift series than the Hardys and quickly disappeared. Meanwhile, the Digests resumed publication and, with a few exceptions, continue to be released at a rate of 6 per year. The plots were toned down a notch and, mercifully, we no longer found the Hardys flying around in outer space. The writing of the Digests varies wildly from abysmal to pretty good with no discernable pattern. There has been a recent trend toward making the stories a bit more adult. In fact, several manuscripts originally penned for the Casefiles series have turned up, with minor modifications, as Digests. In 2000, Simon & Schuster introduced a new cover art style for the Digests in which neither Frank nor Joe is depicted. What the logic behind this is, I don't know but I don't like the new style. In 1997, a spin-off series for younger readers, The Clues Brothers (17 volumes, 1997-2000), was introduced. The stories recounted the adventures of a young Frank and Joe. The stories were short and simple, the print was large and the books were well illustrated. Unfortunately they were also examples of the worst writing and editing in publishing history. In fact, I find it almost impossible to believe that any editor ever so much as cast an eye at any of these stories. It appears they went straight from some high school student's word processor to the printers. Reports to me from people with young boys tell me that the kids avoided the books like the plague. Finally, poor sales killed this series, however, a similar series for Nancy Drew fans (Notebooks) is still thriving. What has kept the Hardy Boys series going? Name recognition, nostalgia and inertia are all factors. Parents feel safe in letting their children read this time-tested series. Young readers can still experience the vicarious thrills the Hardys always supplied. I know that when I read the original stories as a boy, I imagined that I, too, could solve mysteries just like the Hardy Boys did, if only one would have come my way! Old fans like myself, and there are more than you'd think, still enjoy reading yet one more story of our boyhood heroes. Most of the stories are not tied to one particular place in time and so can be read by succeeding generations with no loss of interest. Unfortunately, I've been told by more than one youngster that the Hardy Boys are considered pretty much old hat. My local library reports that the volumes they have see little, if any, circulation. Whether this is due to a lack of interest in reading in general or some animus for the Boys, I'll leave for greater minds to ponder. A poll conducted by Newsday in their Kidsday section found the Hardy Boys trailing even The Baby-Sitters Club in popularity! The advent of online book stores and especially eBay have had a profound impact on the prices of Hardy Boys books and memorabilia. After an initial shakeout when prices varied wildly, savvy collectors began to realize exactly which items were rare and which were not. Very early editions (pre 1932) in dustjackets are steadily increasing in value. Collectors are also avidly seeking the earlier (pre-WWII) stories using the original artwork and the prices for these continue to appreciate. First editions for any title, first editions for new cover art and first editions for revised text are always in demand. For the most part, books missing dustjackets lose about 80% to 90% of their value. The tan tweed books that so many baby boomers are familiar with are virtually worthless without a dust jacket. There is a market for the picture cover (PC) books which contain the original, unrevised stories. Some of these are very rare and are in high demand. Common PC editions can't even be given away, for the most part, unless in outstanding condition. In general, only advanced Hardy Boys collectors are interested in the memorabilia. Virtually all Hardy Boys memorabilia is tied in to one of the TV shows. In the 50's, Disney's Mickey Mouse Club featured a couple of Hardy serials. These generated generated the first of the Hardy collectibles including some promotional items that are extremely rare. In the 60's, there was an animated series that generated more items including a model of the van made by Corgi Toys that is pricey due to a cross-over with Corgi Toys collectors. The motherload was struck with the release of the 70's Shaun cassidy/Parker Stevenson Hardy Boys series. Countless items were licensed and, due to the cross-over for Shaun Cassidy fans (yes, he still has some), some are hard to come by. The key in Hardy collectibles, like all others I suppose, is condition. Since the items were aimed at a juvenile market, there was a high rate of attrition. Those items that survived tend to have seen heavy use. Pristine examples of virtually any collectible will find a ready market and will usually spark active bidding on eBay. There are a few Hardy collectibles that also feature Nancy Drew. Nancy's admirers are fanatical and these items are quite pricey as a result. 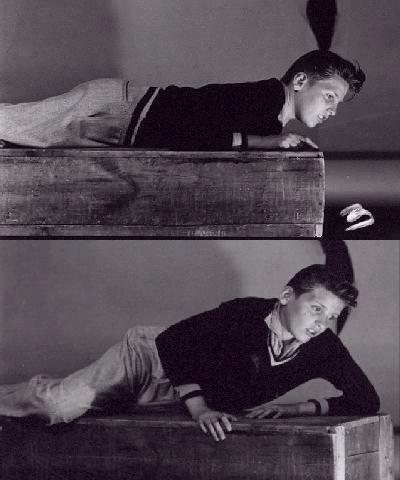 Your Hardy Boys site is fantastic! I have it bookmarked and have visited it several times in order to be able to fully absorb the mountains of information it contains. Keep up the good work. I read the Hardy Boys as a boy and while surfing the net I discovered your excellent site. I had no idea that the Hardy Boys were still as popular as they are and have so many avid collectors. I particularly enjoyed reading the articles and reviews in the Bayport Times. Mike Humbert's take on The Secret Warning was hysterical. Can we expect any more articles from him? Nancy Drew, Tom Swift, Chip Hilton, Judy Bolton, The Great Brain, Harry Potter, Horatio Alger, The Bowery Boys, The 3 Stooges + other books, videos & MORE!